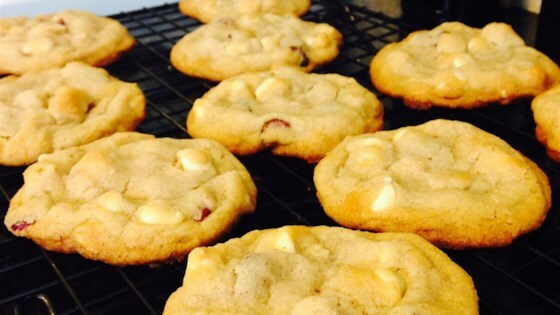 "White chocolate cookies with a hint of cinnamon." Beat butter and shortening together with an electric mixer until creamy and smooth; gradually add white sugar and brown sugar, beating on medium speed, until incorporated. Beat in egg and vanilla extract. Combine flour, baking soda, and salt in a separate bowl; mix into butter mixture until incorporated. Fold in white chocolate and cinnamon. Refrigerate dough for 1 hour. Drop dough by the heaping tablespoonful onto the prepared baking sheet, leaving 3 inches between cookies. Bake in the preheated oven until cookies are lightly browned on the edges, 12 to 14 minutes. Cool on the pans for 10 minutes before removing to cool on a wire rack until cookies are firm.